Most employees tend to prefer the status quo over change for several reasons: fear of the unknown, fear to get out of their confort zone, habbits, etc. Change, however, is a must in todays hiper-competitive, fast-paced world. QualityKick’s Change Control module enables you to define a clear path to request, approve and implement change in a streamlined manner. Even though creating a change request is easy, the employee still needs to provide well-grounded reasons for the change and perform impact analysis in order to get it approved. During change request creation, attachments can be uploaded and tasks can already be created to provide a clear view of which actions this change will require. The Change Control module provides an integrated task management tool. Multiple tasks can be created and assigned to different users. These users will then see these tasks popup on their Dashboard as a TODO list. This facilitates and ensures timely implementation and follow-up once the change request is approved. Additionally, when the change request is approved, these users will automatically receive email notifications to notify each person that they can start implementing and signing off their specific tasks. When the change request is finished, approval can be requested by changing the status to “under signing by approver”. This triggers an automated email notification to the relevant approvers, who with one click arrive at the change request in question in order to view it and decide whether they would like to approve the change request or deny it. Approvers also have the option to return to the previous status if they feel that the provided change request is insufficient. In this case a reason must be provided and the requestor gets notified automatically in order to improve the request. 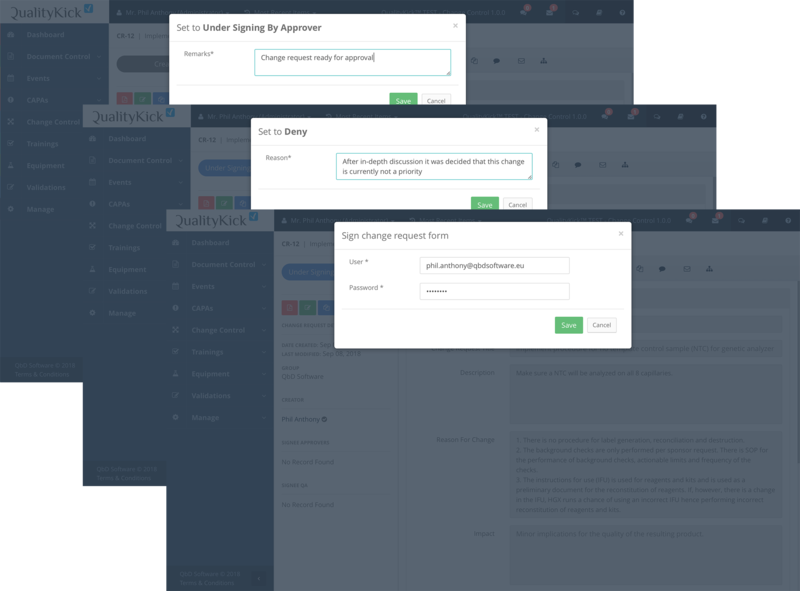 When a change request is approved for implementation, the task responsibles get notified automatically via email to start with their respective tasks. Task responsibles need to sign off on each of their tasks and can upload proof when relevant. If desired, you can configure that each separate task needs QA sign off before it gets set to done. When all tasks are finished, the change request automatically changes to the next status in which QA is asked to sign off and close the change request. As the CAPAs module does not have the possibility to configure specific tasks to users, you can still extent this particular functionality from the change control module into the CAPAs module by simply linking a CAPA to a change request. In this case, the CAPA in question cannot be closed before all the tasks in the change request are finished and the whole change request has been signed off and closed first. 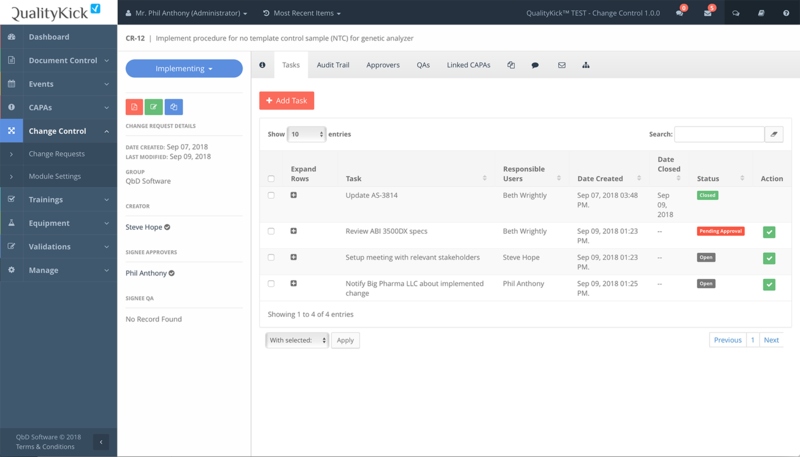 QualityKick’s Change Control module helps employees understand why the change is necessary and further reduces the friction of change acceptance by showing clearly who, and how, the change will be implemented. All QualityKick modules work alike: if you know one of them, you know your way in the others. Also the Change Control module is easy to understand and use. Create, assign and approve a change request and let the system take care of making sure that everybody knows what needs to be done. Even though setting up the module is very easy, we will do that together with you to make sure you understand all possible configurations and that you can start using the module in no time. QualityKick costs depend basically on two things: the amount of modules you use and the amount of users you create. However, you can further keep costs lowe by activating the Change Control module only for users who are allowed to create and implement change requests. The best thing about the change control module is the task management feature, which keeps everybody in the loop and off-loads the responsible person and QA to insist constantly to get things done. This keeps things clear to everybody and maximizes efficiency. QualityKick’s Change Control module has been an important discovery for us. Implementing change is now much easier and faster. It is now easier to decide if a change is necessary. This has helped to improve many of our processes in a relivatively small amount of time. We were using the Events and CAPAs module already and added Change Control later. Even though we received additional training to learn this new module, you could say that it was totally unnecessary as it was really easy to use. Loved it! Below you can find a few of the most frequently asked questions regarding the Change Control module. If you still have doubts however, feel free to contact us! What is a typical Change Request workflow in QualityKick? Once a change request is created it gets the Created status. In this status you can keep editing the change request until it is finished, after which the creator changes the status to Under Signing by Approver. Once approvers have signed off, the change request is then put in the Implementing status. During this status, tasks need to be executed and signed off by each task responsible. When the last task is done, the status is changed automatically to the Under Signing by QA status. QA then decides if it can be closed or if there’s something missing and we need to go back to the implementing status until everything looks good and the change request is closed. Does each finished task need to be signed off by QA separately? That’s configurable in the Change Control module settings. So you can turn this requirement ON or OFF depending on your needs. Some companies find this step redundant, because QA already needs to sign off the whole change request with all its finished tasks, at the end of the implementation. But if you find this useful, you can certainly turn this requirement ON. Can I preconfigure specific types of change requests which already contain a specific set of preconfigured tasks? Well, the Change Control module does not have a “Change Request Types” layer like the Document Control module or the Events module in which something like this could be offered. But you can simply use the “clone” functionality to create a new change request starting from an existing change request. Simply go to a similar change request and click on the Clone icon. This will generate a new change request with the exact same configuration which you can then amend and save. Who can create and participate in a change request? There are 4 types of users in QualityKick: administrators, managers, regular users and read-only users. All users, except for the read-only type of users, can create and participate in a change request and its different tasks, as long as they have access to the Change Control module. Can I upload file attachments to a change request? 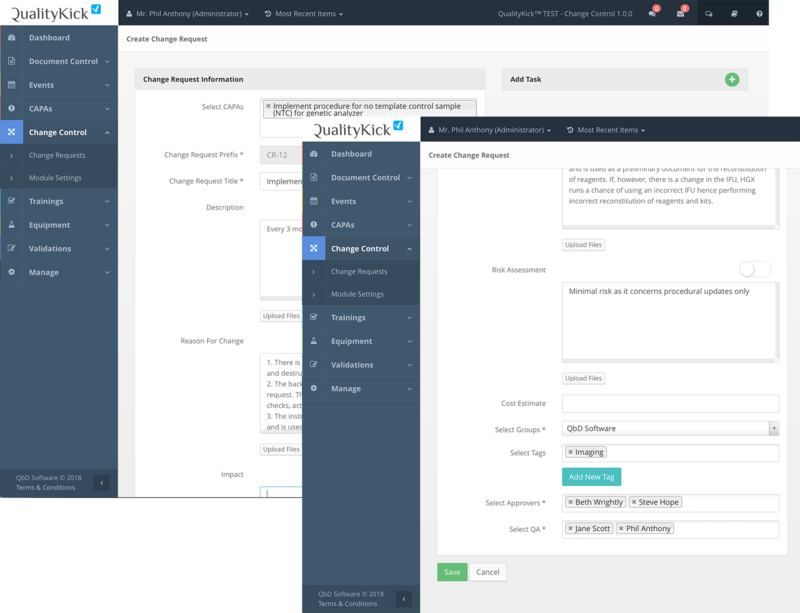 Yes, you can upload files to a change request on multiple occasions. 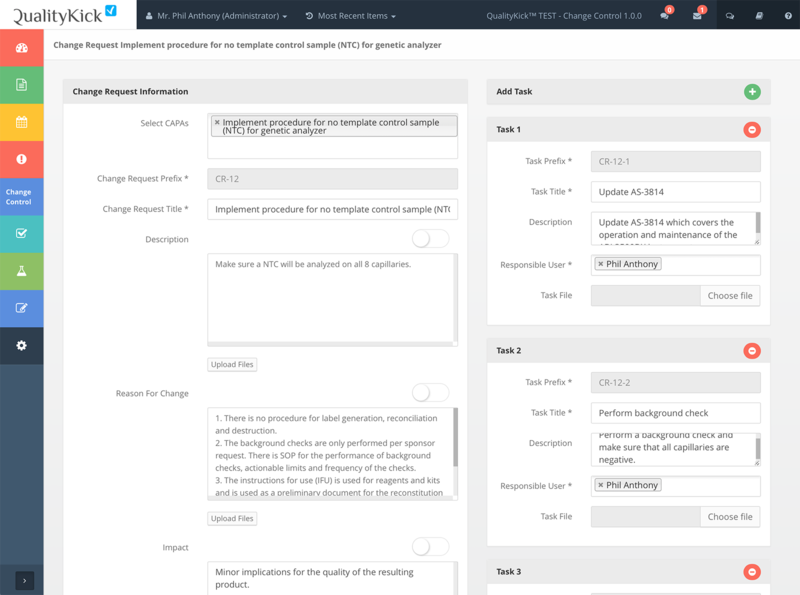 For starters, when defining and documenting your change request you can upload attachments linked to several fields like the main description, the reason for change, the impact field and the risk analysis. Also when defining tasks you can upload an attachment for each task and when executing a task you can upload attachments as proof. As there are many places where you can upload files, all these files can be conveniently found on the Files tab of the change request, where they are listed together with an indication to where each file was uploaded. Can I add additional tasks during the change request implementation? Yes, sometimes you cannot foresee all necessary tasks during the definition of the change request. Therefore, you can indeed still create and assign additional tasks during the implementation phase, if needed. Can I reopen a closed change request? No, you can’t. Once a change request is signed off and closed, it cannot be reopened. Can I limit access to the Change Control module or to specific change requests? 1. You can limit access by deactivating access to the Change Control module for a specific user. Users can only view and work on change requests if the change request in question is placed in a group to which the user has access.